Calling all theatre companies from across the region! a Company of Fools invites you to compete in a friendly contest of creation in celebration of World Theatre Day! Those brave enough to participate will have only 48 hours to create a new piece of theatre based on inspiration items provided by their fellow competitors. A panel of esteemed judges will adjudicate the performances. Bribes are encouraged and trash-talk, laughter, and silliness are sure to abound – all in the interest of dethroning last year’s champions – Toasted Theatre. 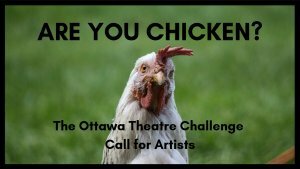 Who will take home bragging rights as Ottawa’s Best Theatre Company and walking away with the esteemed privilege of holding the coveted Rubber Chicken Award? Email info@fools.ca with the subject line “I’m not chicken!”. Please provide us with your company name, a brief company bio, and a list of participating company members. Deadline for submissions is March 14th. Note: An inspiration party will be held at 7:30pm on March 25th, where competitors will exchange inspiration items. Participating companies must send at least one delegate to the event.